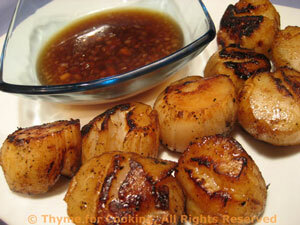 Thyme for Cooking's Main Courses: Grilled Scallops, Steak. If using wooden skewers soak in water for a few minutes. Mix oil, soy sauce and paprika. Thread onto skewers, if using. 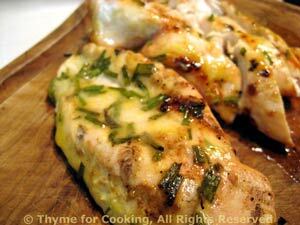 Remove and serve with Lemon Ginger Dipping Sauce - either on the skewers or off. Squeeze lemon, you should have 1 1/2 - 2 tbs juice. Heat oil in small saucepan. Add shallot, ginger and sauté briefly. Add chicken stock and white wine. Bring to a boil and boil until reduced by half. Add lemon juice and soy sauce, heat briefly. 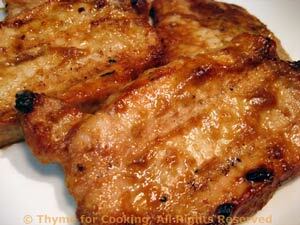 Turkey cutlets cook quickly, and work very well with marinades. If you can't get them get a turkey tenderloin and either slice it into thin cutlets yourself or ask your butcher. 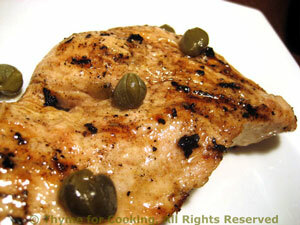 You could also use boneless, skinless chicken breasts. 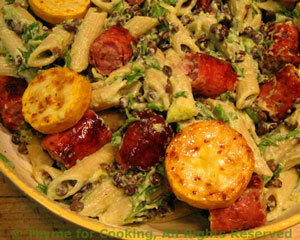 Put capers, lemon juice and oil in small bowl and whisk to combine - mixture will get very thick. Put turkey in a shallow dish, spoon marinade over and let marinate for 15 minutes. 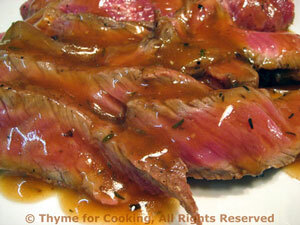 Remove from marinade and cook on barbecue grill for 3 - 4 minutes per side depending on thickness - or until done. Or can be sautéed in nonstick skillet over medium heat for the same time - or until done. Similar to a Satay, this slightly spicy marinade goes well with pork. For maximum flavor, poke the pork with a fork after adding the marinade to allow it to penetrate the meat. We had thin chops that cook quickly; try not to overcook, slightly pink is now preferred for pork. Mix all ingredients for marinade and pour over chops. Let marinate for 15 - 20 minutes. Cook on barbecue for 5 - 8 minutes a side or until done. Slightly pink is preferred - take a peak (techniques). Or fry in nonstick skillet over medium-high heat the same amount of time. Serve.